﻿20 minutes later…the mix is starting to sound good again. Rock on! “Hmm…that bass part should cut through a little more,” you say to yourself. So you adjust the compressor for a few minutes. It starts to sound awesome, then? BAM! Another clip light. You click the light off, then turn down the bass. Now it sounds too quiet, so you have to go turn everything else down again. 20 minutes later, it sounds okay, but not as good as it was sounding before. You’re feeling a bit cranky. If feels like you take two steps forward, then the stupid clip light makes you take three steps back. You spend more time recovering from clipping than you do actually mixing the song. Time to call it quits and go watch Seinfeld. The problem here, obviously, is that you’ve set the levels of your tracks way too high. In your excitement to get started on the mix, you didn’t give any thought to the levels. You just brought everything up until it sounded nice and loud to you, and you never looked back. I’ve written about setting levels for mixing before, and I recommend you read that article. 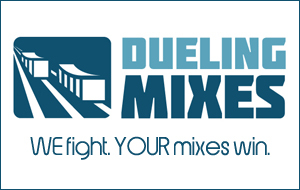 Everyone wants mixes that are loud and full, but you won’t get there by running your levels too hot. On the contrary, actually. You’ll end up simply frustrating yourself to no end. Perhaps you’ll never even finish the mix, because it becomes more of a chore than anything. There are no rules or formulas I can give you. I can’t say, “Set the kick drum to -9 dB on the meter, and the snare drum to -5 dB.” Strict rules like that never work in the audio world. You simply can’t create a formula for a great mix. Most of us learned how to set levels for mixing by playing the red light game…a LOT. Over time (for me it was several years), we eventually learn our lesson and adjust our mixing habits. I’d love to save you a few years of playing the red light game. I’d love it if you could skip over all that frustration and start getting better mixes. The key to good levels is so simple it almost seems silly to even talk about it, but this single task has improved my mixes tremendously. Rather than turning up the individual tracks in your session, before you start mixing ANYTHING, turn up the volume knob on your monitors (or headphones). If the knob is normally at 9:00, turn it up to 2:00. The louder your monitors are, the less likely you are to turn up your tracks to an inappropriate level. I’m certainly not advocating listening at ridiculously loud volumes. That’s not the case at all. What I am encouraging you to do is to set to turn up the volume so that you can hear things clearly without cranking up the individual tracks. This will force you to keep the individual fader levels of your tracks much lower than you would have before…and you’ll find that you’re hardly ever playing the red light game anymore. You may think that having such dramatically lower levels in your mix will make your mixes too quiet, and that it will be too difficult to accommodate for this in mastering. I found it to be completely the opposite. All of the mixes from my album Out of Indiana, were mixed using this approach, so the mixes themselves weren’t terribly loud. When I sent them to my mastering engineer, he had plenty of dynamic range to work with, and he was able to make them sound nice and loud without making them sound squashed and over-compressed. Keep that in mind when you mix. Today’s challenge is obvious: turn up your monitors! Kindly report back here and let us know if it helps.